Seeing Him is the story of Kate, a small business owner, and Adam, a trans male doctor, who fall in love and have adventures with their outrageous friends. It was a webcomic funded on KickStarter, then funded on Patreon to keep it going, and updated from June 2015 to December 2015 on Pink Dollar Comics. However, Pink Dollar Comics is now gone. Which also meant that Seeing Him briefly disappeared. Now, I’m bringing it back online. When Will We Be… “Seeing Him”? Seeing Him, the Webcomic is a project by Kia Crawford (the writer) and myself that was successfully funded on KickStarter. In the time between the last day of the KickStarter and…today, Kia and I have been working hard to make the comic and send out rewards to our backers. So, the biggest reason you haven’t heard much news post-KickStarter is because the backers come first. 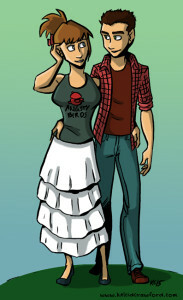 That, and we’ve been working with Pink Dollar Comics, the host of the comic, to set everything up before it’s launched. Today I have exciting news to share with y’all. Seeing Him, the Webcomic, will officially be online on June 16th! 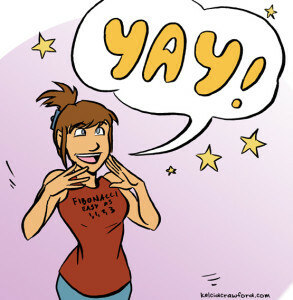 The webcomic will update twice a week on Tuesdays and Thursdays, in full color, on Pink Dollar Comics. If you have other questions about the comic, leave a comment below and I will answer them to the best of my ability. Tone it down a bit there, Juli. Yeesh! At a later point in chapter 1, on Adam and Kate’s second date, they both play a roller hockey game with their friends at the roller rink Kate manages. Unfortunately, Adam is terrible at roller hockey and Julianne got a penalty (“I’m ‘too aggressive,’ or whatever,” she says), so they both sit in the penalty box. 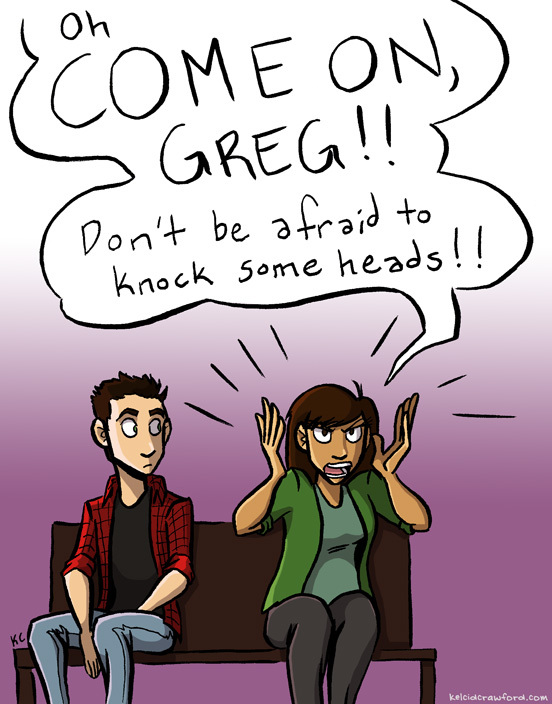 If you want to see more of their shenanigans, please pledge to Seeing Him, the Webcomic on KickStarter. And then tell your friends about it! Any bit of help is really appreciated. P.S. In yesterday’s blog post I said I would write about my DC trip this last weekend. Woops! I’ll remedy that tomorrow. What’s the KickStarter Funding Next? Ok, before I update you on how my trip to DC went, I need to make this post explaining something, because there’s been a bit of confusion. Back in November, Kia and I ran the first KickStarter for Seeing Him, the Webcomic. That’s the campaign that failed. Not just because the goal was too high, or the rewards were too much work. The reason the goal was high was because we hoped to fund the first two to three chapters of the series. We failed the first time. So when Kia and I regrouped, we decided to only fund raise for the first 15 pages. It wasn’t the entirety of chapter 1, but 15 pages had a goal of $600. We both felt that $600 was a good, attainable amount to start with for an unknown webcomic. The idea was, if we didn’t get funded at all, we just wouldn’t make the series. However, if we got funded at $600, we could make additional comics pages the stretch goals. We would LOVE to get enough funds to make the first chapter in its entirety. But for a webcomic that hasn’t started yet, that may be asking a bit too much. 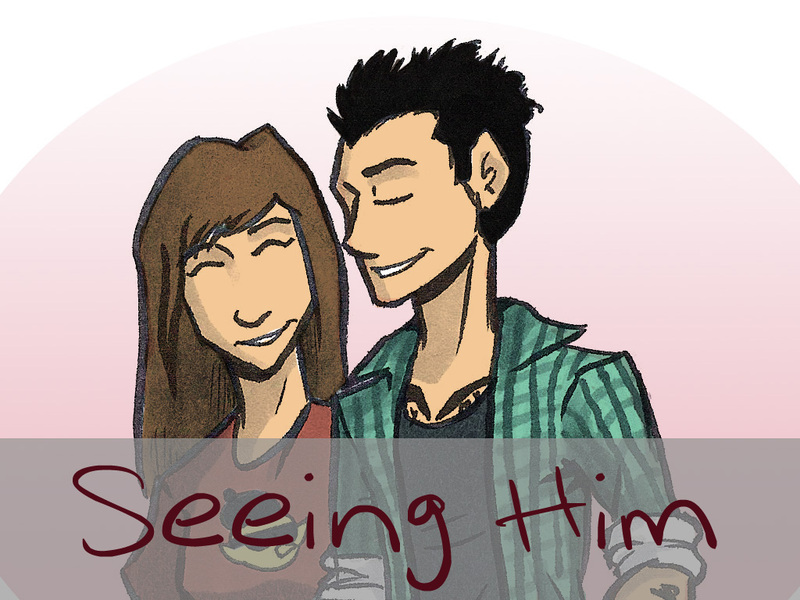 So far, everyone has been super supportive and helping to get Seeing Him, the Webcomic funded! We are already up to a $100 stipend for Kia. Now our next goal is $750, to help cover Kia’s stipend and 20 pages of comics! The stretch goal after that, $900, will get Kia a bigger stipend of $150 AND get the full chapter done! So, if you can, please give your support, whether you pledge or spread the word. Every little bit helps and we have less than 14 days left! P.S. Tomorrow I’m going to talk about my trip to DC this last weekend. Look forward to: sunburns, cuckoo clocks, and art history. Oh my!